Have trouble getting rid of blackheads using natural products? Then you might want to try coconut oil. This all-natural remedy has been used since ancient times for its healing properties. It’s safe, effective, and inexpensive. Not only is coconut oil good for blackheads, but can also leave your skin smooth. Packed with fatty acids and antioxidants, coconut oil is considered a superfood. This natural remedy can be ingested, applied on the skin and hair, or used in homemade beauty products. You can even mix it with protein powder and smoothies for quick energy. Some people add coconut oil to their daily coffee to speed up weight loss and curb hunger. Some make their own remedies such as toothpaste, moisturizing creams, and lotion bars using this ingredient. Others apply it on the skin to prevent and reduce stretch marks. This healthy oil can be used in a multitude of ways. Its unique combination of fatty acids reportedly can clear acne, improve skin’s elasticity, and make your hair shine. When ingested, it supposedly can have therapeutic effects on brain disorders like Alzheimer’s and epilepsy. Research also indicates that coconut oil supports cardiovascular health, lowers bad cholesterol levels, and reduces heart disease risk. On top of that, it enhances your body’s ability to burn fat and it can accelerate metabolism. Coconut oil is widely used in beauty and skin care products. Some of the best acne treatments and moisturizers out there contain this ingredient. Studies have found that coconut oil hydrates the skin, prevents dryness, and minimizes the appearance of wrinkles and fine lines. It is also thought to delay the aging process and make your skin more flexible. This natural remedy is rich in capric acid, lauric acid, and caprylic acid, three medium-chain fatty acids (MCFAs) that support optimal health. Unlike the long-chain fatty acids found in vegetable oils, these healthy fats are easier to digest and have anti-fungal and anti-microbial properties. Due to their small size, they are quickly absorbed into your body and allow easier cell permeability. Lauric acid, one of the key ingredients in coconut oil, is a powerful antimicrobial agent that can kill viruses, bacteria, and fungi. Acne and blackheads are often caused by pathogens, which is one reason why coconut oil can be an effective treatment for acne and blackheads. It can also help fight skin infections, eczema, inflammation, and candida overgrowth. Coconut oil contains around 40 percent to 59 percent lauric acid, making it one of the richest sources naturally available. Another active ingredient in coconut oil is capric acid, which boasts antimicrobial, antibacterial, and anti-fungal properties. This fatty acid is absorbed through your skin and increases hydration without leaving it feeling greasy. Along with lauric acid, it’s responsible for some of the supposed health benefits of coconut oil. According to some health experts, capric acid protects the skin from infections and toxins, kills viruses and bacteria, and reduces the amount of moisture lost through the skin. It’s also an emollient and can accelerate wound healing. In general, this ingredient is used in face creams to enhance their beneficial properties and thin them out to the desired thickness. Coconut oil is also a great source of antioxidants. When consumed or applied on the skin, it fights free radical damage and reduces the harmful effects of UV rays. This remedy ensures proper functioning of the sebum glands, which can help prevent and clear blackheads. Due to its anti-inflammatory effects, coconut oil reduces inflammation from acne and can promote cell repair. When used externally, it creates a protective barrier that guards your skin against harmful effects from the environment. All these factors combined can help reduce acne and prevent breakouts. 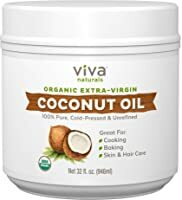 The Organic Extra Virgin Coconut Oil from Viva Labs has a low price tag and meets quality standards. It’s unrefined, cold pressed, extra virgin, kosher, and USDA certified organic. Unlike other similar products, it has no gluten, trans fats, bleach, or pesticides. It can be used for cookies as well as a hair mask, body moisturizer, and skin care treatment. Another great product is the Vitacost Extra Virgin Certified Organic Coconut Oil. Made from certified organic coconuts, it’s an excellent source of fatty acids and promotes overall health. This product is tested for heavy metals and contaminants and manufactured in an NSF Certified facility. Due to its high purity, it can be safely applied on the skin to clear acne, blackheads, eczema, and other disorders.